Dessert. It's something we all need in our lives... but we don't need the excess calories (or kitchen hassle) that can come with it. 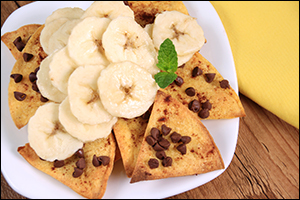 Well, each of these fruity treats requires just three simple ingredients (we call 'em Hungry Girl Trios) and has less than 200 calories per serving. Sweet deal, huh? Cut tortillas in half. Cut each half into 3 triangles, for a total of 12 triangles. Place tortilla triangles close together on the baking sheet. Lightly spritz with nonstick spray, and sprinkle with a dash of cinnamon. Carefully flip triangles and bake until lightly browned and crispy, 3 - 5 minutes. Remove sheet, but leave oven on. Rearrange triangles on the center of the sheet so that they touch and slightly overlap, like a pile of nachos. Sprinkle with chocolate chips. Bake until chips have softened, about 2 minutes. Looking for more fun stuff to do with your powdered peanut butter? 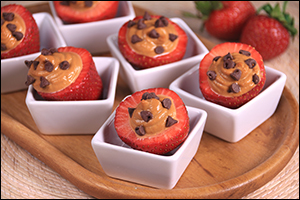 Guilt-free stuffed strawberries are always a good idea! In a medium bowl, combine powdered peanut butter with 2 tbsp. water. Mix until smooth, uniform, thick, and creamy. If needed, add water in 1-tsp. increments and mix again. Spoon peanut butter mixture into the bottom corner of a plastic bag, snip off the tip of that corner to create a small hole, and pipe mixture through the hole into the strawberries. Lightly press chocolate chips into the filling. 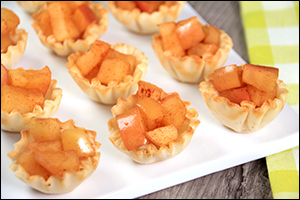 Teeny-tiny apple pies with HUGE flavor… Who knew these could be so easy to make? Meanwhile, in a medium-large microwave-safe bowl, top apple with brown sugar and 1/4 tsp. cinnamon. Stir to coat. Cover and microwave for 2 minutes, or until apple has softened. Fill shells with apple mixture. Hungry for More Sweet Trios? Three easy recipes with three ingredients each. Keep the trend going by sharing today's email with three of your pals -- click "Send to a Friend" now! We just realized that we're 9 days into April and have yet to acknowledge National Grilled Cheese Month. Click and celebrate, folks!